Cooking spaghetti squash just got way faster! 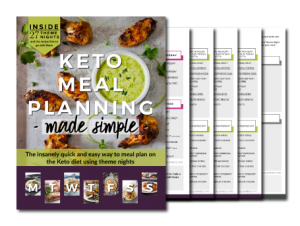 Prepare it in the Instant Pot! 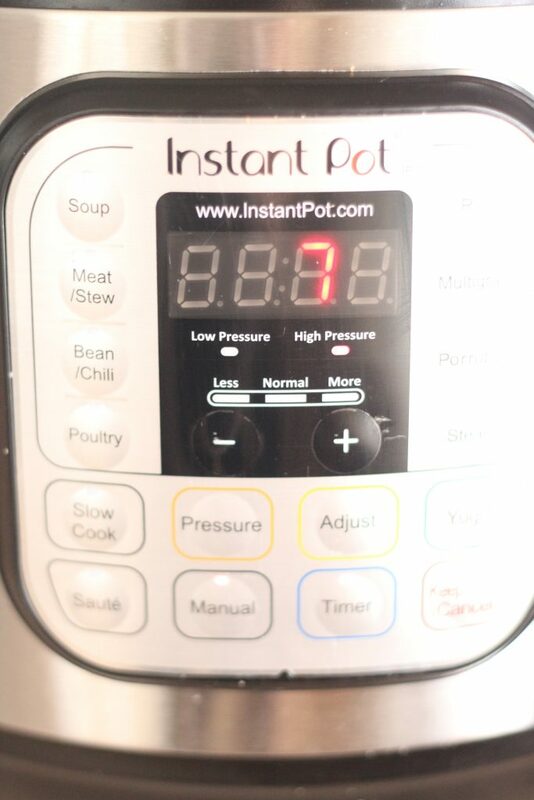 Put your Instant Pot to good use and cook quick pressure cooker spaghetti squash in under 15 minutes! Spaghetti squash is one of my favorite things to eat. Sure, it’s not the same thing as carb filled pasta, but it does try to fill that void. It’s a great vessel for my favorite carbonara sauce and is delicious with just a bit of parmesan cheese and butter. 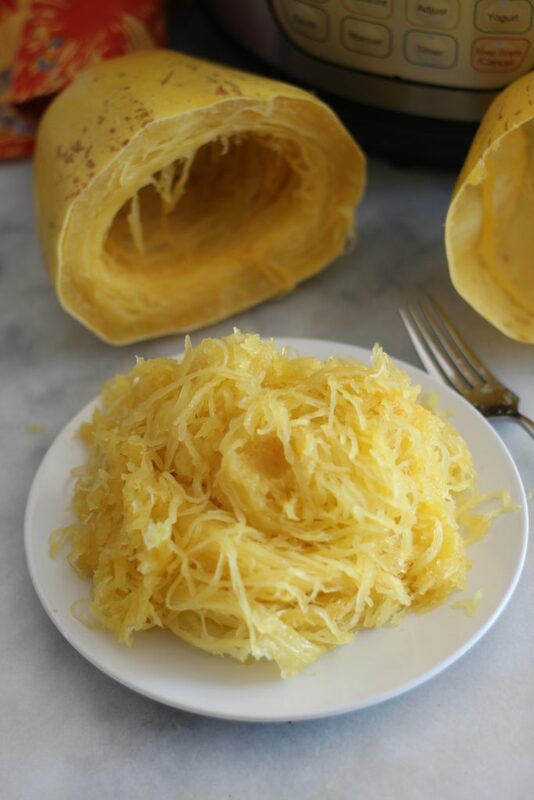 A cup of spaghetti squash has about 7 total carbs, 1.5 grams of fiber and 31 calories. Using the pressure cooker is just getting better and better. I can get frozen chicken breasts ready to eat in under an hour. My cauliflower rice and hard boiled eggs are always perfect and so easy to peel. And today I’m cooking my spaghetti squash in the instant pot. You are going to love making this quick pressure cooker spaghetti squash. I typically roasted the spaghetti squash in the oven for nearly an hour. It required time and forethought, since I had to plan dinner early enough to bake the squash. Plus, running the oven for an hour in the middle of a hot Arizona summer is not a good time. 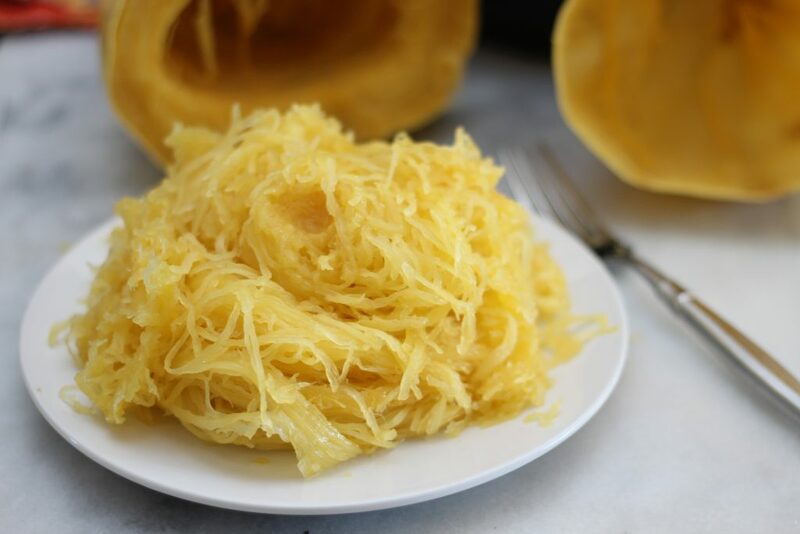 Making the spaghetti squash in the pressure cooker (Instant Pot) was so simple that I feel guilty for turning it into a post. Almost, but not really. 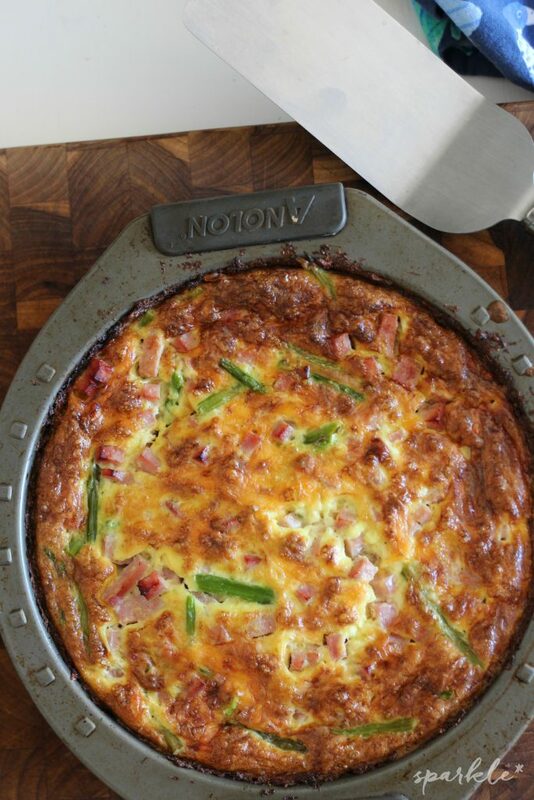 The truth is that I reference my own recipes on this site all the time, this is my place for safe-keeping the best ones. 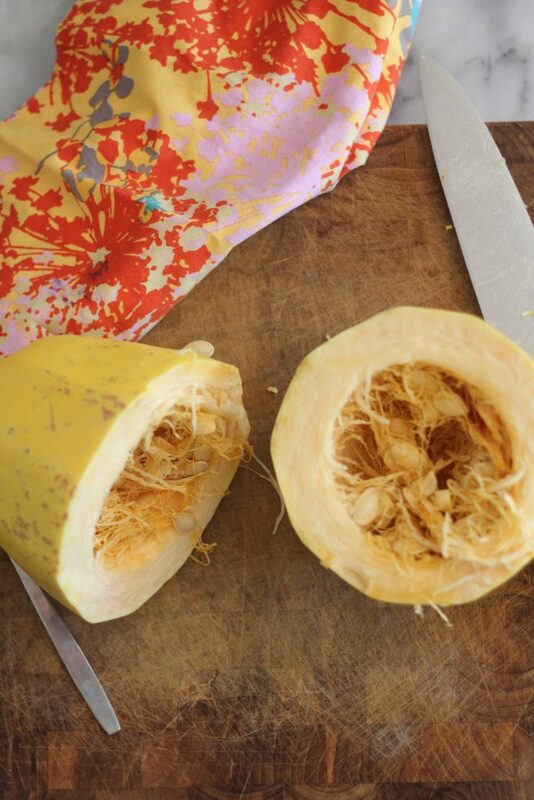 Not sure what to do with spaghetti squash? Try this Spaghetti Squash Carbonara for dinner tonight! So with this spaghetti squash, I wash the outside first, and remove any labels if any. Cut the thing in half with a hacksaw. Ok, maybe not a hacksaw, but a big sharp knife. I received a tip from a reader, that if you cut it at the middle, as opposed to the ends, the strands will be longer, plus it’s easier to cut. 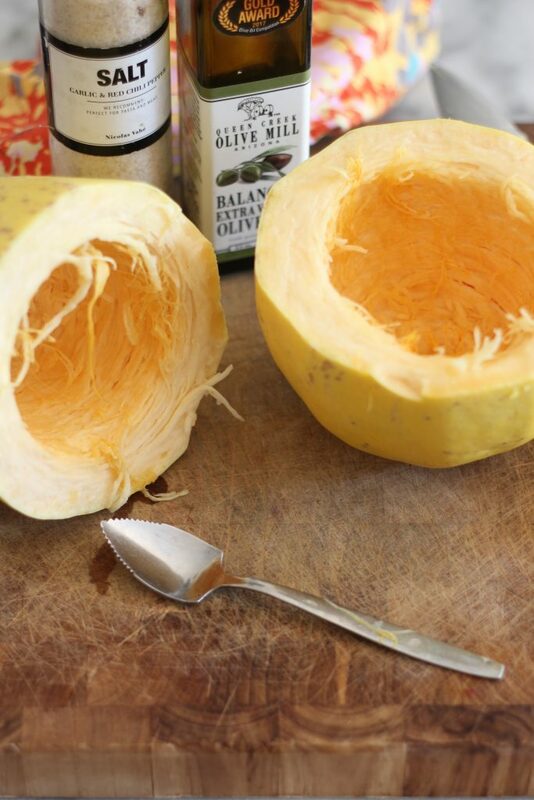 Need a simple spaghetti squash recipe? Try this Cacio e Pepe Spaghetti Squash! Then all you do it let it cook. It takes about eight minutes to get to pressure, and seven minutes to cook. After the seven minutes are done and it beeps. I leave it for a minute and then vent the steam to do a quick release. The spaghetti squash will be hot hot hot, so let it cool in the pressure cooker with the lid off for a few minutes. When ready, use a fork to pull out the strands of spaghetti and add your favorite sauce! 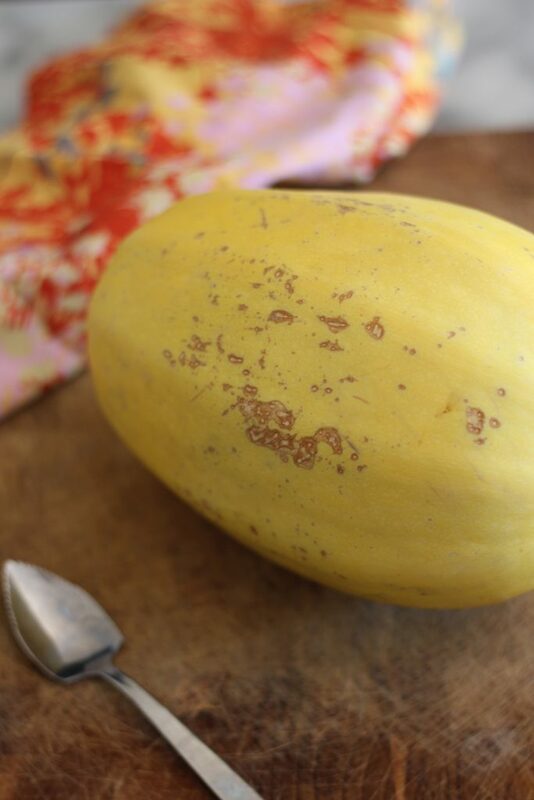 So are you going to start making quick pressure cooker spaghetti squash?I think you should! I love spaghetti squash and we cook ours in the crock pot. I have to get one of these famous pressure cookers everyone rants about soon. Thanks for sharing at To Grandma’s House We Go! I have never heard about spaghetti squash before. My Bad. But it sounds delicious & yum! Making it under 15 mins sounds like a perfect dish. Thanks you for sharing this dish at Fiesta Friday. I’m sure everyone will love it! We love spaghetti squash, but have never cooked it in the pressure cooker. I’m going to have to try it. Thank you for sharing at Friday Feature Linky Party. 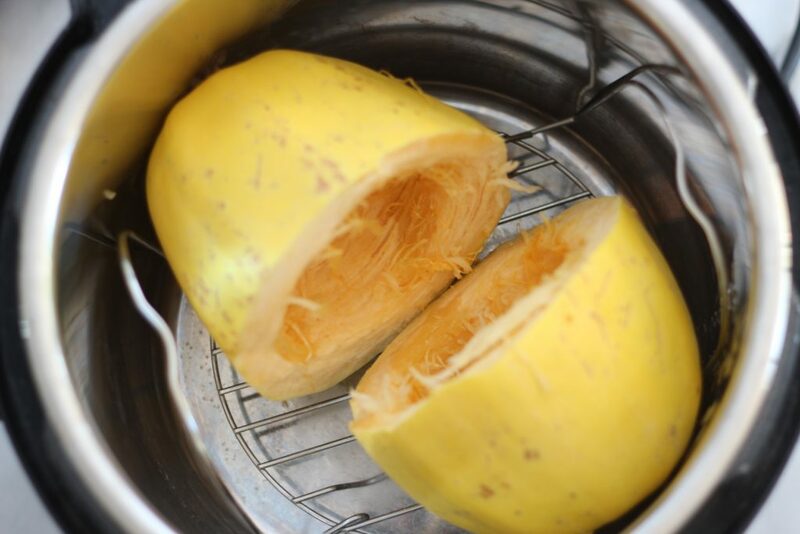 I love spaghetti squash, but have never tried pressure cooking it. Thanks for sharing with SYC.